Brands: Superdry, Aquascutum, Pandora, Thomas Sabo, Specialized, Mongoose, We the people, Kidsmill, Adorable Tots, 4Moms, Baby Jogger, Babycotpod, BeSafe, Boori, Cybex, Cybex by Jeremy Scott, Izziwotnot, Sarah Louise, Theophile and Patach, Lascal, Gordonsbury, Ergobaby, Aerosleep, Aveda, Arran Aromatics, BareMinerals, Bellapierre, Bronnley, CHANEL, Gamila Secret, Jo Malone London, L’Artisan Parfumeur, M•A•C, Molton Brown, Murdock, Nails Inc, Penhaligons, Rituals, Wild About Beauty, Denon, Yamaha, Geneva, Teac, Marantz, Monitor Audio, Outback, Napoleon, Q Acoustics, Frank Olsen are all excluded from this offer. Needs to be used within 3 weeks of receival of account specific code. I got one too, I tried checking out with £1 total plus c&c but it says you need to spend another £9. 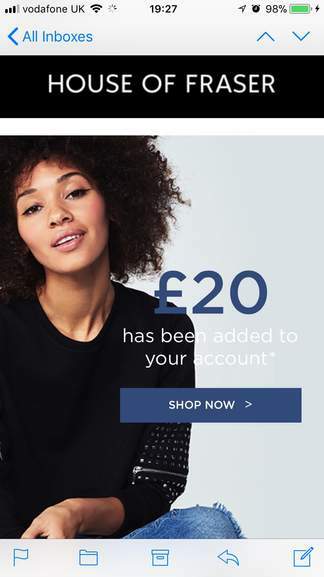 So £10 minimum checkout after code plus delivery/c&c.